“Right to work” originated in the South in the 1940s and ‘50s, an element in the drive to keep Southern workers divided and the South segregated and non-union. Only four states became right to work in the 50 years between 1960 and 2010. After a decades-long, and largely successful, campaign to eliminate unions in private-sector workplaces, right-wing ideologues like the Koch brothers turned their attention to the still union-dense public sector. Since 2012, these forces have mounted well-funded and successful campaigns to enact right to work legislation in six states, some previously considered union strongholds like Michigan, Wisconsin, and Indiana, such that a majority of states, 28, are now right to work. 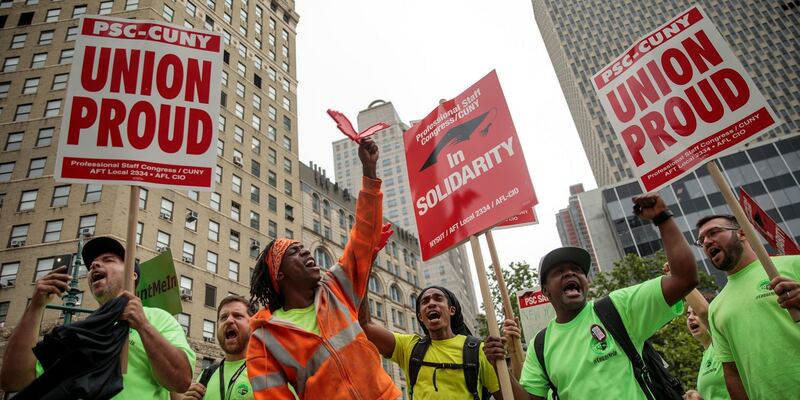 The other reactionary decisions of the Supreme Court in recent weeks also underline the necessity of the labor movement standing proactively on the side of all the oppressed. The unions need to take the lead in fighting Trump’s attempts to criminalize immigrants, in the assault on women’s reproductive rights and against racism and sexism generally. The social power of the working class is vital to defeating the agenda of the right and to building a sustained mass movement that can drive out Trump..